Happy Friday team! More importantly, happy LONG WEEKEND! 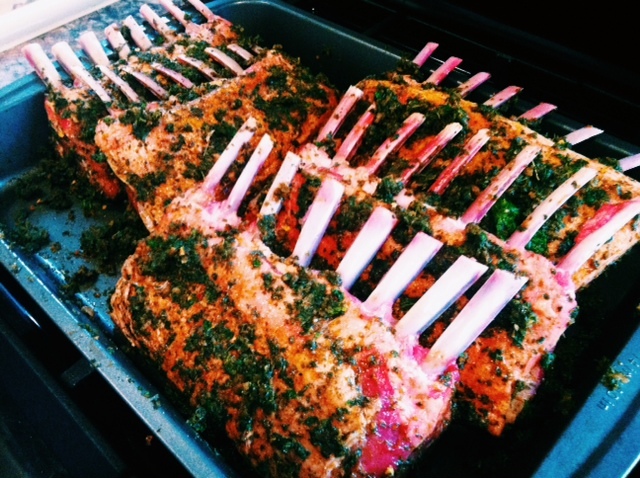 Maybe the federal holiday will give you some extra time to allot to cooking up something incredible?! May I suggest these bad boys? 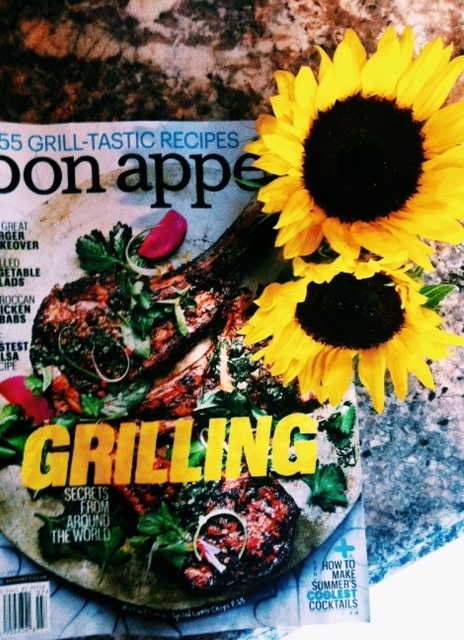 Featured on the cover of the special grilling issue of Bon Appétit magazine, it was basically love at first sight. 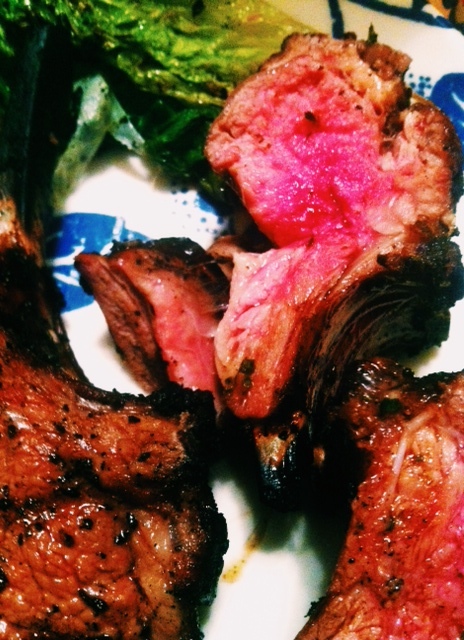 I decided immediately these Mint and Cumin Spiced Lamb Chops should be the main feature of the birthday dinner I had last weekend. Granted, depending on where you shop (ahem, Whole Foods) and how many people are included in the experience, these are not technicallyyyy nommin’ on a budget worthy. BUT, I needed to present them to the blog world regardless. Click on the above link for all necessary ingredients and instructions. These need to be prepared at least 2-3 hours ahead of scheduled meal time so they can marinate in all the spicy goodness. 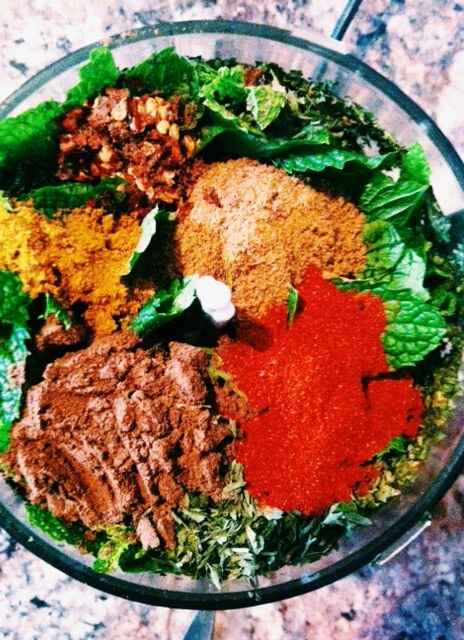 The plethora of spices! Make sure to follow the measurements veryyyy carefully. Pulse until finely chopped and well-mixed. 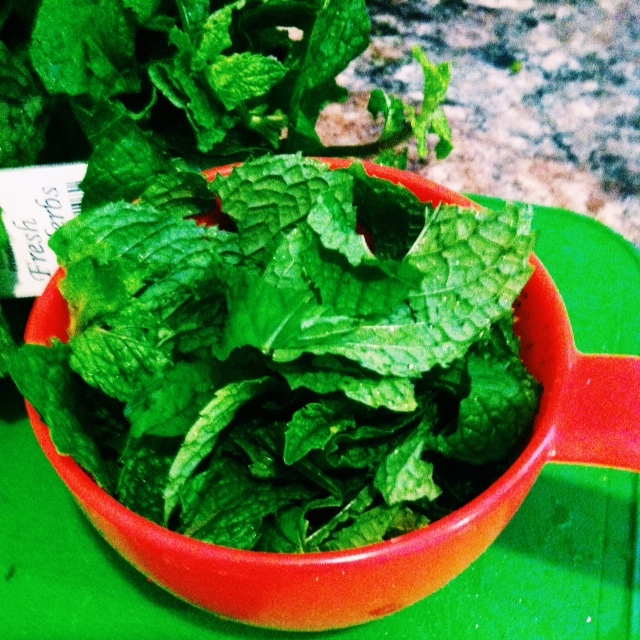 Food processing the mint leaves will actually make a sort of wet substance… have no fear as this allows you to spread on the lamb very easily. 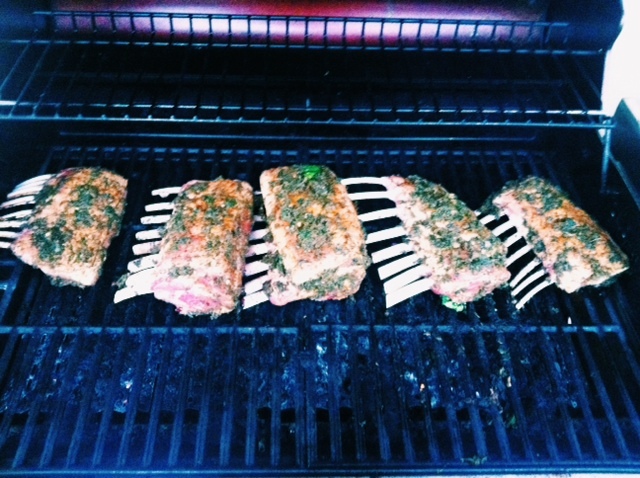 After at least two hours, pop on the grill. 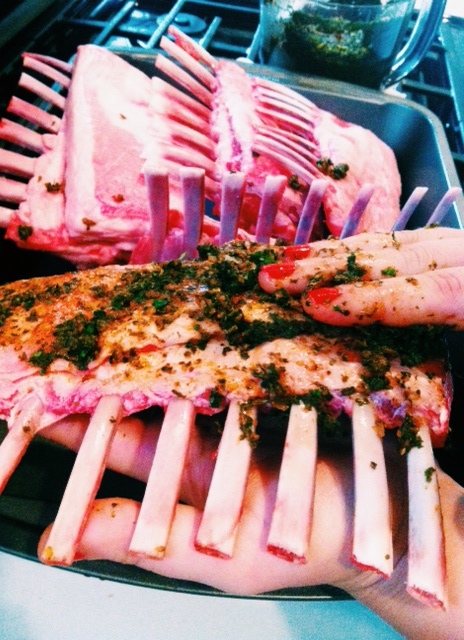 KEEP the layer of fat on the chops as it permeates the meat while cooking for an awesome flavor. You will have to grill these bad boys for a bit longer than the directions say. We grilled for about 10-15 minutes total, flipping over a few times, and then cut the chops apart at the end and continued cooking for 5 minutes to make sure they weren’t too rare (the goal was medium-rare). And yes, the eight of us ate all five racks. Enjoy! Well we’re officially post-Memorial Day! Coupled with 80 to 90 degree daily weather, I think it’s safe to assume we have approached the summer season! Despite the impending humidity and overheating in pencil skirts, I am definitely looking forward to spending time outside on my deck, grilling up delicious meals for friends and family. My usual go-to meal is some sort of delectable burger, mixing and matching fresh ingredients to jazz up my red meat. But as we know, too much of anything isn’t a good thing. So in an attempt to take a healthier, less fatty route, I whipped up this salmon burger recipe last week- gotta love my girl Martha Stewart’s culinary insights! It takes less than 30 minutes and serves four. Pair it with these awesome grilled stuffed zucchini boats for a nutritious, flavor-packed meal! 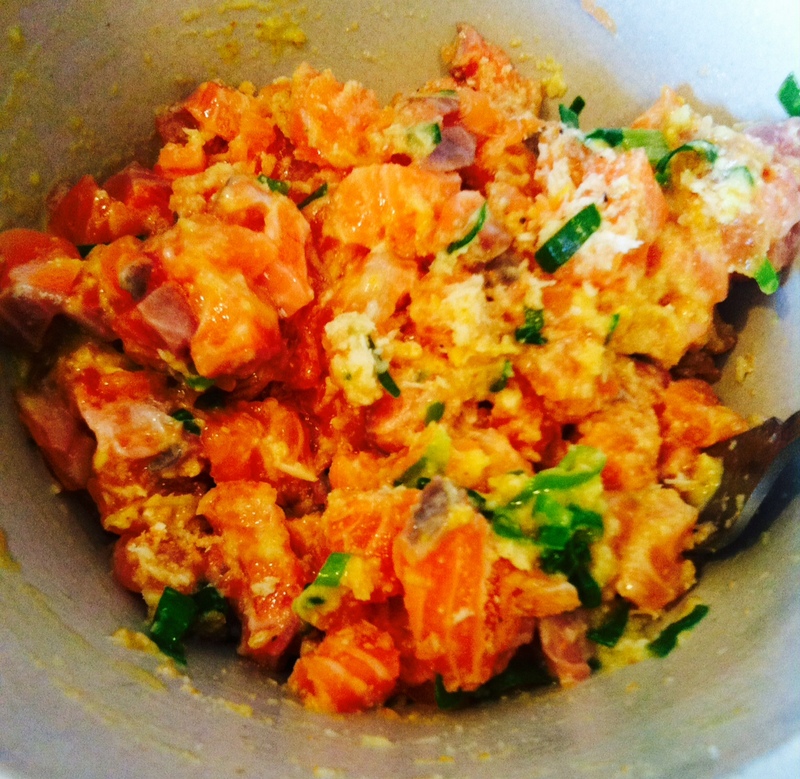 To make the burgers, start by dicing the salmon filet. 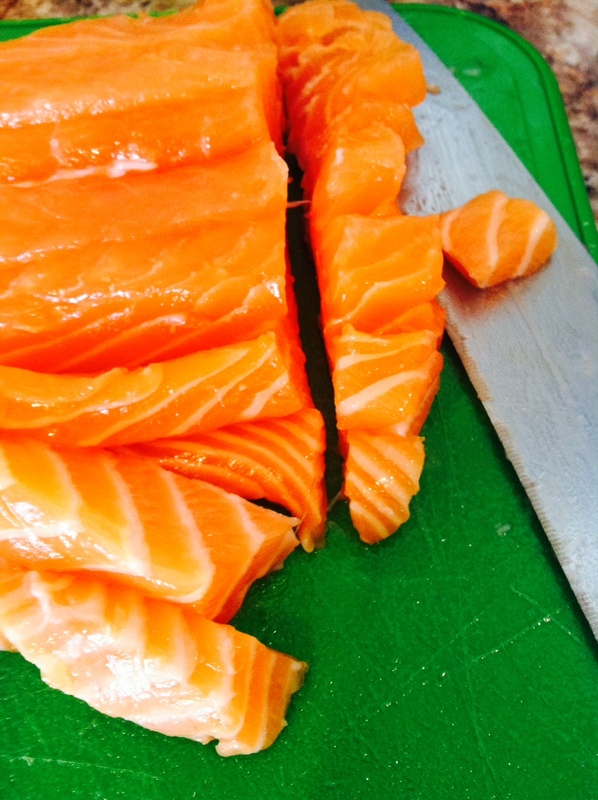 The best way to do this is to use a sharp knife and slice the salmon lengthwise in 1 inch strips, then cut crosswise to make 1 inch by 1 inch cubes. It’ll be easy to make the patties without crushing the fish. In a medium bowl, combine the salmon, horseradish, lemon zest and juice, egg, scallions, breadcrumbs, 1 teaspoon salt, and 1/8 teaspoon pepper; mix gently with a fork. Turn on the grill to high heat. 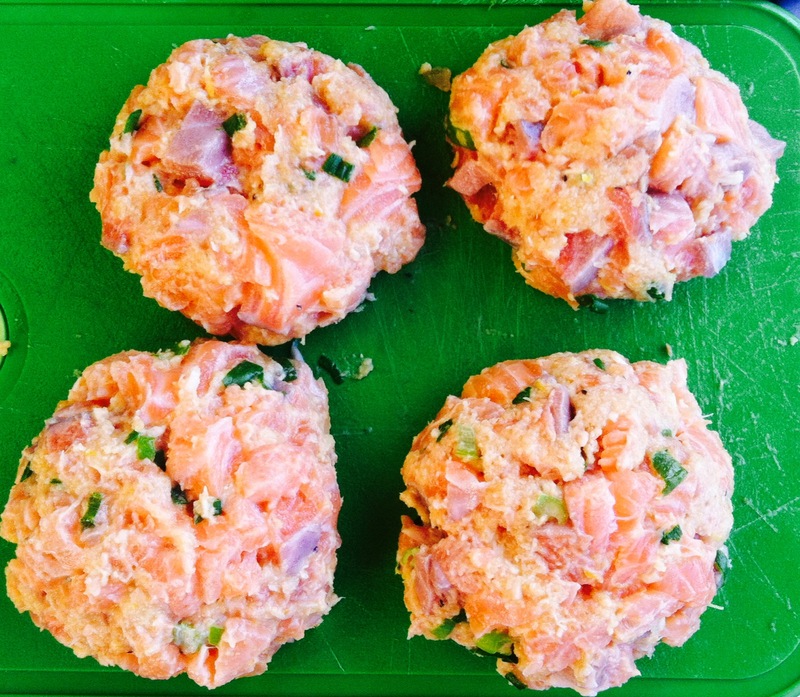 Grab handfuls of the salmon mixture and make four even patties. Almost ready for the grill! But first, let’s make the zucchini boats. 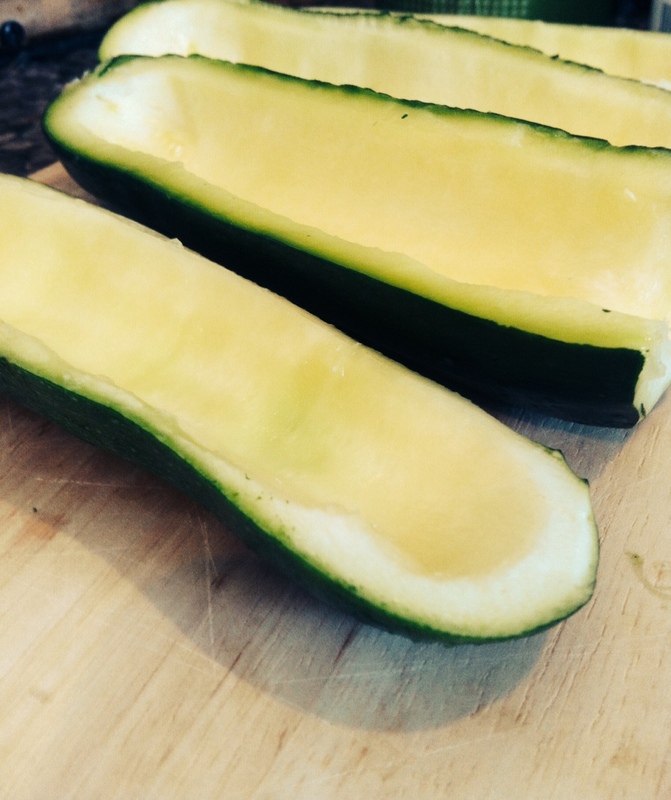 Cut each zucchini in half the long way. Take a spoon and scoop out the insides, leaving 1/4 inch perimeter around the skin so the boats keep their shape. Then cut across in half. 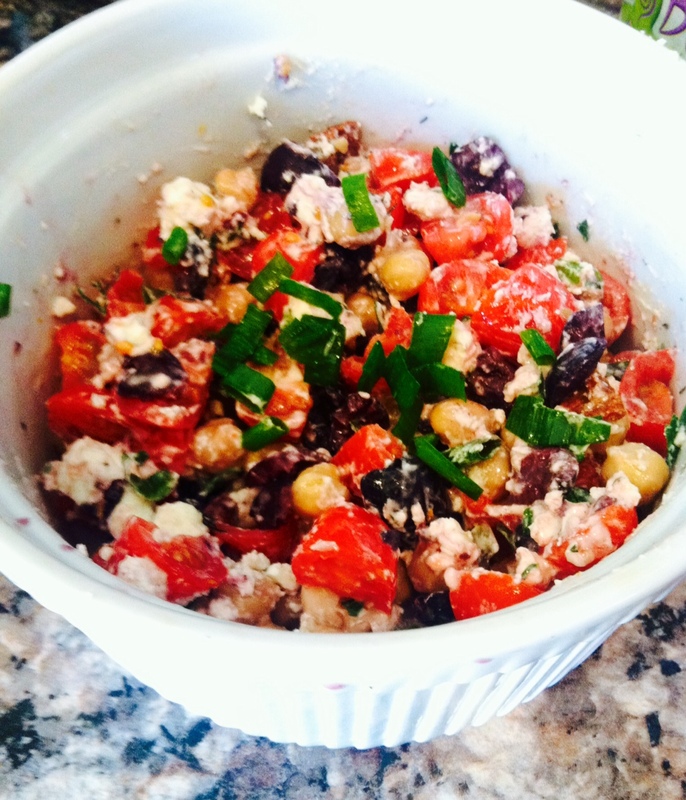 In another medium bowl, combine the garbanzo beans, chopped tomatoes, chopped kalamata olives, green onions, goat cheese, and pesto. Mix together and taste to your liking. In a smaller bowl, mix together the chopped fresh dill and yogurt and set aside. Now, place the salmon patties on the high heat, and grill for 5-7 minutes on each side or until done. Simultaneously grill the zucchini boats by placing them scooped-side down for 5 minutes, then flip over for an additional 5 minutes or until tender. As burgers come close to being done, halve the Naan bread and place on the grill to heat up. 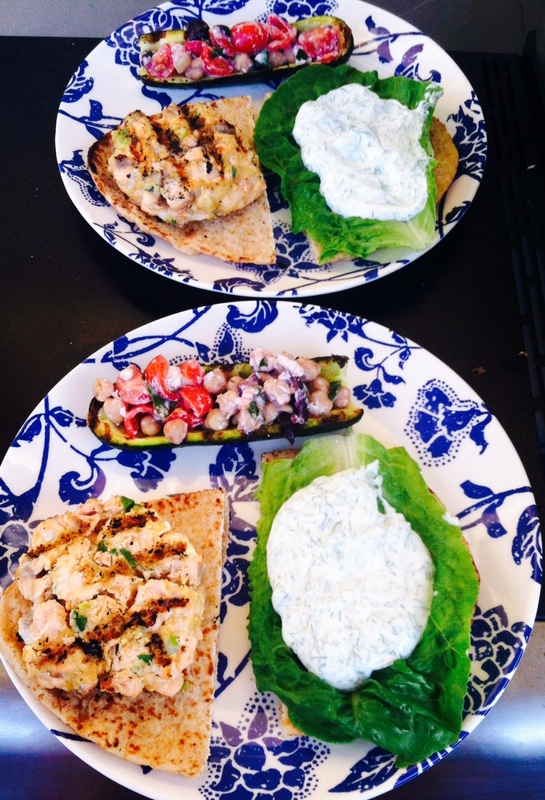 Remove the zucchini boats from the grill and fill in with your goat cheese veggie mix. 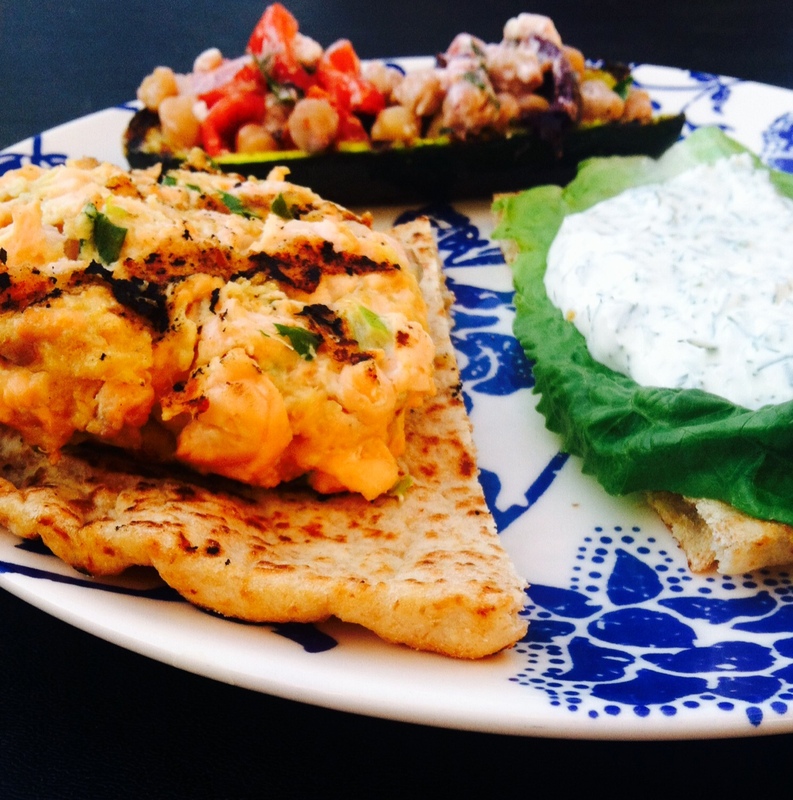 Remove patties from the grill, place on Naan bread with romaine lettuce and a huge dollop of the dill yogurt mix. HOW GOOD do these look?! And I have to say, the salmon burger was equally as delicious as its red meat counterparts. Now get to grillin’!